BellaBassFly: THE BAREFOOT BIKER: Casey Brown's way of the wildcard. 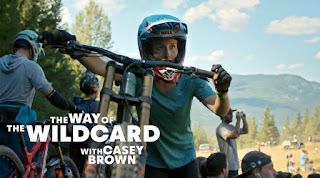 THE BAREFOOT BIKER: Casey Brown's way of the wildcard. ‘Way of the Wildcard’ released every Wednesday tells the story of unexpected athletes succeeding in the most unlikely circumstances. Brought up in near solitude within the New Zealand wilderness, Casey Brown and her brother kept themselves entertained by honing their skills on the FMB track with the aim of making it pro. Casey’s world changed when her family moved to Canada, and she was faced with integrating herself into society as well as battling to the top of the world stage. Check back next week for Episode 3, where we head out to the banks of the White Nile to catch up with Sadat Kawawa and his love for Kayaking.